This entry was posted in Faculty, Research, Staff and tagged associate provost, Research on November 21, 2013 by Wire Eagle. AUBURN UNIVERSITY – Following an internal search, the Offices of the Vice President for Research and Economic Development and the Provost announce the appointment of Zhanjiang “John” Liu as Auburn University’s associate vice president for research and associate provost, effective Dec. 1. As associate vice president for research and associate provost, Liu will serve as a liaison between the university’s administration, the colleges and schools, the Alabama Agricultural Experiment Station and the Alabama Cooperative Extension System, in addition to representing Auburn among key stakeholders in government, industry and foundations. A professor in the School of Fisheries, Aquaculture and Aquatic Sciences, Liu has served as the associate dean for research and assistant director of the Alabama Agricultural Experiment Station since 2007. 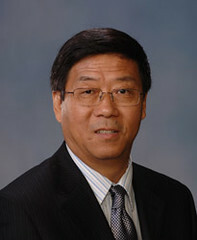 A recognized leader in the field of genome research of catfish, Liu’s previous appointments include serving as director of the Program of Cell and Molecular Biosciences in the Aquatic Genomics Unit, coordinator of the college’s China Programs, Alumni Professor and director of the Department of Fisheries and Allied Aquacultures. Liu will be responsible for supporting academic units in identifying, facilitating, promoting and developing sponsorship for cross-disciplinary research initiatives, in addition to working closely with the associate deans for research and various university committees and governance groups to implement Auburn’s strategic research goals. Liu received a Bachelor of Science in 1981 from Northwestern Agricultural University in Shaanxi Province, China, followed by a master’s degree in 1986 and a Ph.D. in 1989 from the University of Minnesota. He is a member of the College of Agriculture’s Academy of Fellows and the American Association for the Advancement of Science. In 2012 Liu was named honorary dean at Qingdao Agricultural University’s College of Marine Science and Engineering and has been recognized by the USDA for his outstanding work in the field of aquaculture.